With Spring temperatures melting away the ice and snow, flooding will be inevitable. Did you know that in 1993, two thirds of Wisconsin’s 72 counties were declared a federal disaster area due to the Spring thaw! Could you imagine all the homes without a standby home generator to provide power to their sump pumps? Midwest Electric & Generator serving the metro area and surrounding communities of Minnesota, Wisconsin and North Dakota stands by our strong commitment to always keep your lights on and provide your home with back up power through any power outage including flooding. Our qualified and experienced technicians will give you the peace of mind you deserve to have when disasters like flooding occur. Although there is little anyone in the path of flood water can do to stop it, you can make sure your sump pumps are prepared to work properly, even when there is a power outage. This is a must do priority as flood waters do not discriminate on what property to harm and carry dangerous pathogens that infiltrate everything they come into contact with. Where flooding is widespread, consider installing a standby generator from Midwest Electric & Generator. 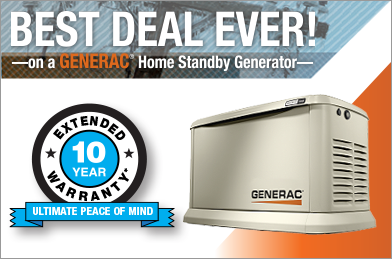 A standby generator would keep your pumps running and the flood waters out. This would prevent the damage from the Spring thaw we will soon see. A medium to large air-cooled standby generator with the right automatic transfer switch can provide enough power to keep most moderately sized homes comfortable with the added conveniences of power to electronics and televisions. Make a great decision today by calling Midwest Electric & Generator to schedule a free in home consultation. We are sure you will be pleased with the added security and peace of mind that through any weather condition you may face, your standby generator will be there to keep your lights on, pumps pumping and lifestyle at ease.